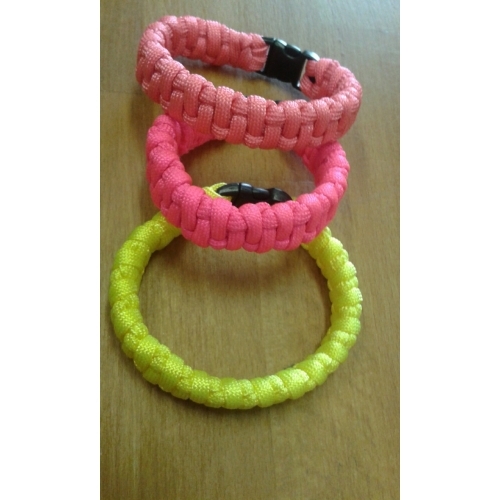 Neon Pink 7.5" Candy Pink 8" Candy Pink 8.25" Neon Yellow 8.5"
The paracord survival bracelet is made from top quality 550 paracord and contains approximately 7 to 8 feet of paracord and a manual release buckle. As well as the paracord being able to be unravelled and used in emergency situations the bracelet has become popular as a fashion accessory with outdoor enthusiasts. The profit made from these paracord survival bracelets will be donated to good causes and currently this will be the local hospice to help fund non-clinical enhancements to provide a less clinical environment for the patients. To get the correct size for you simply measure where you will wear it snuggly with a tape measure and add an extra three quarters of an inch to an inch for a good fit. These are handmade by Darrian so please excuse occasional subtle differences in looks.